Recognizes the real interdependencies that exist in the Bay Area economy. Recognizes the success of the Bay Area Economy is increasingly reliant on the seamless movement of people and goods around and through the region. Recognizes individual communities benefit from the economic activity of the region as a whole and therefore need to play a role in meeting the region’s needs, such as building diverse housing. Recognizes the labor force is distributed across the region, typically living and working in different cities. There were many substantive contributors to this project. Linda Galliher (Former Bay Area Council Vice President) and Brianne Riley (Bay Area Council Policy Associate) contributed to the workforce development recommendations. Economic Institute Interns Carolyn Garrett and Duke Butterfield III provided valuable research assistance. Rufus Jeffris (Bay Area Council Vice President, Communications) provided critical writing and editorial input. Micah Weinberg (Economic Institute President) provided valuable feedback on the development of the report. The Bay Area is a global economic powerhouse. It is the model high-tech innovation hub, spawning generations of the world’s most iconic brands—companies like Intel, Apple, Tesla and Google—and innovative products and technologies. Companies and creative people flock to the region to develop new technology, lead breakthroughs in science, start companies, and drive the continued evolution of the region’s open and highly productive innovation ecosystem. The Bay Area hosts high concentrations of federal and private research labs driving radical breakthroughs in science and engineering; attracts nearly half of all venture capital invested in the United States; and has developed a diverse network of highly specialized business services that support the innovation economy. Its universities are among the best in the world. The region’s population of early adopters helps drive technological advance and new applications of technology that help improve communities and lives. Many of the regions cities are on the cutting edge of leveraging new technology platforms for improving the delivery of public services. The Bay Area’s stunning natural beauty and mild climate only add to its appeal. And yet, for all its strengths, the Bay Area lacks any cohesive and comprehensive regional economic strategy for sustaining economic growth, weathering business cycles and supporting shared prosperity across the region. Given the regional nature of the economy, its labor pool, housing sheds, job centers and commute flows, viable solutions must reflect a regional perspective. 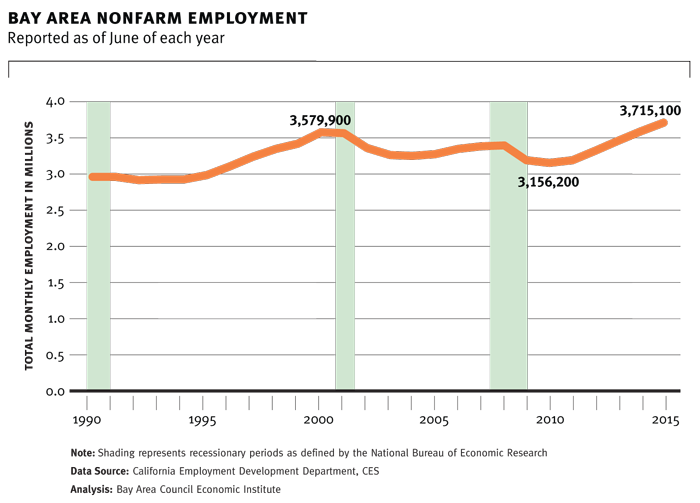 The Bay Area has not prepared for the normal pace of growth over the last several decades. This becomes painfully obvious during periods of economic expansion. If not meaningfully addressed, persistent issues around housing, transportation, and the workforce threaten the region’s current growth cycle and its ability to rebound into the next growth cycle. Technological advance is driving change across the economy, disrupting markets and entire industries, promising new opportunities, and adding pressure to the growing skills gap. The robust economic growth in the Bay Area is one of the strongest in the US coming out of the last recession. 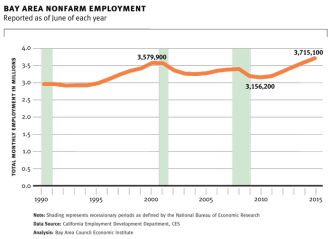 Since 2010, Bay Area employment has grown at nearly double the rate of other US metropolitan areas. 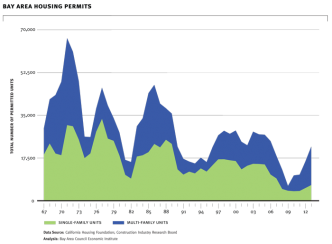 The housing market has reached a crisis point. Our region’s workforce is commuting longer times, from farther distances, and paying a greater share of household income for housing, reducing quality of life and forcing businesses and families to relocate. Transportation networks are stressed. As people are priced out of the region’s core, congestion and commute times have increased—over 20% of commutes exceed 45 minutes. BART ridership has risen 55% since 1998, and the system is at capacity during peak commute times. Gains in income following the recession have been uneven. Income disparities are exacerbated by a growing skills gap. In California, middle-skill jobs account for 50% of California’s labor market, but only 40% of the state’s workers are qualified. High housing costs in the Bay Area have reached a crisis level, and regional policies need to address this issue by incenting sustainable growth and combating resistence to development. Lack of investment in the region’s aging and overcrowded transportation systems is undermining the Bay Area’s future prosperity. In addition, a lack of strong linkages across transit agencies inhibits a systemic approach to addressing the region’s growing and changing transportation needs. The Bay Area requires regional collaborative action on workforce development in order to improve programming and funding efficiencies and better span the growing skills gap. The region’s economic development requires focus and a regional perspective. 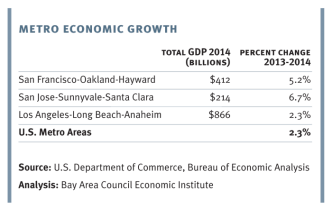 The Bay Area needs to facilitate best-in-class infrastructure investment to support the growth of the regional economy. As uncertainty and volatility increase, how do we grow our economic, environmental and social resilience? Resilience is an ability to recover from or adjust easily to misfortune or change. New opportunities come with change, and they are best leveraged when a community is willing to proactively shape the future. The remaining option is a reactive mode, responding to immediate crises instead of preparing strategically for the future which is inherently different than today. The purpose of the Regional Economic Strategy Roadmap is to offer concrete actions for growing regional prosperity and a flexible framework for developing actions going forward. Its proposals are evergreen agents of economic resilience, strategies wise in both expansion and downturn, necessary to accelerate the former and dampen the latter. It is a recipe for a robust and enduring regional economy. 1. 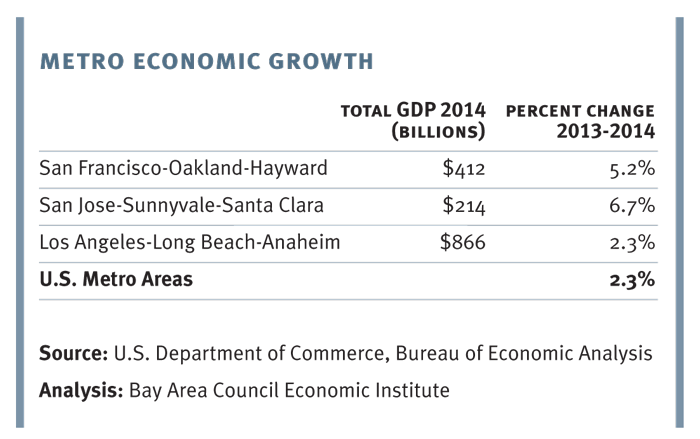 The Bay Area needs to facilitate best-in-class infrastructure investment to support the growth of the regional economy. Restructure the financing of public infrastructure through the creation of an empowered regional planning, finance, and management entity. Reform existing public institutions. New mechanisms and processes are needed to expedite critical infrastructure development. Give the empowered regional entity authority to gain financial support. Funding tools such as expanded tolling on bridges, highway corridors, and express lanes can be leveraged and allocated to key projects. Drive project delivery. Improve efficiency in the planning and permitting of infrastructure development. Facilitating public-private partnerships can be helpful, as private sector capital and management expertise can deliver superior value for the public. Develop new sources of traditional and alternative finance to augment public resources. Bring a regional funding mechanism to the voters. There is opportunity for a realignment of tax structures related to transportation in the region. A shared regional sales tax, gas tax, or vehicle license fee can supplement existing county transportation sales tax measures. Prioritize spending on key regional infrastructure. Projects such as the connection of BART to San Jose, Highway 101 and Caltrain corridor improvements, a new transbay BART tube, and expanded water transit services should have access to shared regional funds. 2. High housing costs in the Bay Area have reached a crisis level, and regional policies need to address this issue by incenting sustainable growth and combating resistance to development. Build sufficient housing stock to meet the demands of a growing regional population and help to fill historic deficits. The Regional Housing Needs Allocation (RHNA) process needs real teeth. Connecting state and regional government transportation funding allocations to housing production goals can provide an incentive for cities to meet their RHNA obligations. Actual housing production needs to be consistent with local and regional plans within a reasonable timeframe. Otherwise there need to be real consequences. such as loss of local approval authority, state mandated “by right” approvals of housing projects, the creation of more “by right” zoning districts, or the creation of a regional hearing body to approve housing developments. The Bay Area must expand the stock of secondary units or “in-law” units. 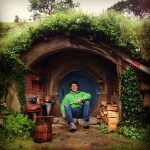 Legislation should be drafted to expand and simplify approval of “in-law” or Accessory Dwelling Units (ADUs) so more density can be accommodated throughout residential areas in the region, not just on large development sites. A regional fund should be created to help homeowners finance ADU projects. The fiscalization of municipal land use decisions needs to change. Current tax policy encourages local governments to zone for commercial over residential land uses and must be modified to expand sites for housing. Reduce the cost of new home construction across the Bay Area. Encourage streamlined approvals for lower-cost construction types and new building technologies. Streamlining building permitting and codes to allow for mid-rise vs. high-rise and for new innovations in construction, such as Factory Built Housing, can lower building costs. Cap impact fees region-wide. The impact fees assessed by cities on new housing are increasingly preventing construction, and new options should be explored for funding community infrastructure so that the costs of promoting livable communities and affordable housing are shared among both existing and new residents. Reform the California Environmental Quality Act (CEQA). 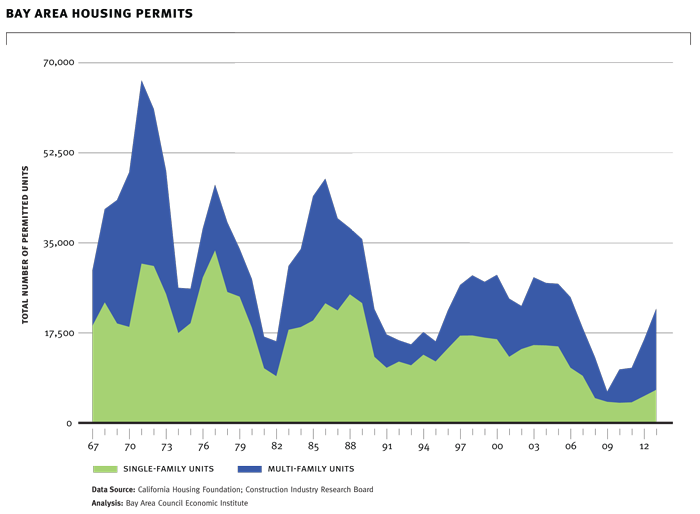 CEQA litigation has become a significant barrier to infill development. A CEQA exemption for new home construction meeting transit-oriented development goals should be created to limit costly lawsuits. 3. The region’s economic development requires focus and a regional perspective. Create the Bay Area Regional Economic Development Partnership, a regional body that would sustain the Bay Area’s global economic competitiveness. Create a platform for public-private collaborative action across jurisdictions on regional economic strategy. Creating consistent business permitting guidelines across jurisdictions and aggregating zoning, tax incentive, and local development plans can assist businesses looking to expand their operations in the Bay Area. Facilitate the growth of Bay Area companies within the region and support the entrance of new companies. A regional partnership could provide a unified voice for communicating the diversity of development opportunities in the region, internally and externally. Provide local governments with concrete planning and other support to unlock development potential. Due to limited resources, local governments often do not have the capacity to launch major projects that could be of significant benefit locally and regionally. For example, a regional partnership could offer planning and other resources to local development projects around transit hubs and former military bases. 4. The Bay Area requires regional collaborative action on workforce development in order to improve programming and funding efficiencies and better span the growing skills gap. Establish the Bay Area Collaboration on Workforce Development, a regional public-private collaborative to better connect employers’ skills needs and workforce training programs and improve resource alignment. Create a system for ongoing communication between the region’s employers and educator/training community. A collaboration of employers, educators, trainers, and other stakeholders can enable highly adaptive and cost-effective planning for competency development programs driven by the changing needs of employers. Provide public education and inform public policy. Inform the public and key stakeholders about current economic trends and promising certificates, credentials, and career pathways. 5. Lack of investment in the region’s aging and overcrowded transportation systems is undermining the Bay Area’s future prosperity. In addition, a lack of strong linkages across transit agencies inhibits a systemic approach to addressing the region’s growing and changing transportation needs. Improve the efficiency of transportation systems in order to support the current economic growth cycle and prepare for the next. Align the region’s 26 transit agencies. 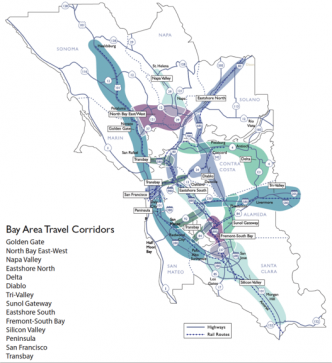 A single Short Range Transit Plan for all regional transit services in the Bay Area would enhance regional planning for the transit system, which otherwise could only be accomplished through transit agency consolidation. Given the nature of growth, a regional super agency will be necessary in the long term. Utilize funds to implement Corridor Operation and Investment Plans. Collaborative planning will ensure that corridor operational and investment strategies are consistent and mutually supportive across jurisdictions in key transportation corridors. Create an Innovation Incentive Program. Funds should be set aside for grants to Bay Area transportation agencies, cities and counties that propose the most promising applications of technology, incentives, entrepreneurism, and market mechanisms to improve transportation performance.